Cutter pumps chop solid matter before pumping. In some cases, a tungsten carbide cutting tip is integrated onto the leading edge of the nonclog impeller. The cutting tip and the saw-shaped edge of the suction plate form the cutting mechanism. The particles are shredded and pumped together with the wastewater by the nonclog impeller. This eliminates clogging at the suction of the pump and allows clear passage to the discharge piping. Cutter pumps should cut solids to a point where they pass through the system. This can use less energy and cause less wear on the pump, allowing for efficiency and a longer pump life. This approach can work well when maceration is not necessary to complete the work the system is designed to perform. Cutter pumps are used in locations that commonly clog, including hotels, prisons, restaurants, retail spaces, in wastewater treatment, canal restoration and municipal pump stations. They can also pump manure in livestock farming, process water from slaughterhouses and fruit washing plants, waste on fishing vessels and clinker wastewater from coal bunkers. Chopper pumps are designed in end suction centrifugal design, as well as submersible design and are found in applications prone to severe clogging. Chopper pumps use a rotating cutting bar mounted externally at the suction side of the pump. The cutting bar chops large objects prior to their entry into the pump. Chopper pumps can be robust in design and have a moderate head and flow range. Larger solids and ragging can pose a potential issue. Grinder pumps use a mechanism in the suction port to macerate and grind garbage, rubber goods, plastic bags, fabrics and other difficult-to-pump items into small pieces carried by sewage. They then transfer them under pressure. These pumps eliminate clogging in small diameter pipes common in low pressure sewer systems. Grinder pumps are high head (pressure) and lower flow, and typically use a 3,600 revolutions per minute (rpm) electric motor. Cutter pumps are designed to handle raw sewage, wastewater and heavy-duty industrial applications where the pump is subject to clogging from oversized materials. A quality cutter pump will have a tungsten carbide cutting edge brazed onto the leading edge of the impeller vane. 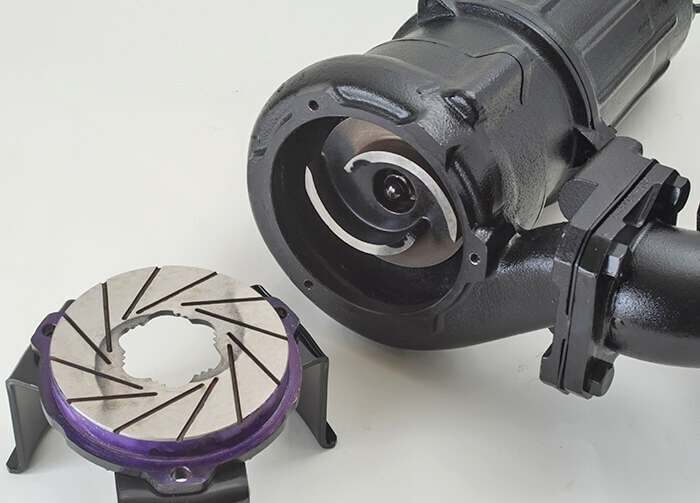 When running in close proximity to a hard iron serrated suction cover, this mechanism cuts incoming materials into pieces, permitting smooth passage through the pump into the discharge piping. This type of design typically allows for a larger solids passage since there is no external bar across the suction inlet. Cutter pumps can be found in high-head (pressure) variations with 3,600 rpm motors and also high-flow versions with 1,800 rpm motors, which provide higher torque for cutting. Pocono Township, Pennsylvania, was experiencing a recurring problem with the performance of its sewage pumps clogging excessively. The sewage pump station handles residential waste along with commercial flow from local hotels and other local businesses. Every time the pumps would clog, an alarm sounded and an employee was dispatched to the pumping station to pull the pump out, unclog it and put it back into service. This became a time-consuming and costly process. Township officials grew tired of the time and cost associated with these nuisance clogs. The township engineer referred them to a pump distributor that serves their area. The distributor felt that a cutter pump would be the solution that Pocono Township needed to resolve its clog situation. The Pocono Township application required a pump that would provide 483 gallons per minute (gpm) at 16.5 feet of total dynamic head with a motor output of 7.5 horsepower (hp). This product was selected because there is a substantial amount of water and waste flowing through the station making it extremely vital for the pumps in place to be working properly, as excessive clogging can decrease the normal life expectancy of a pump. Over the last two years, the township had the three pumps at the pumping station replaced with cutter pumps. 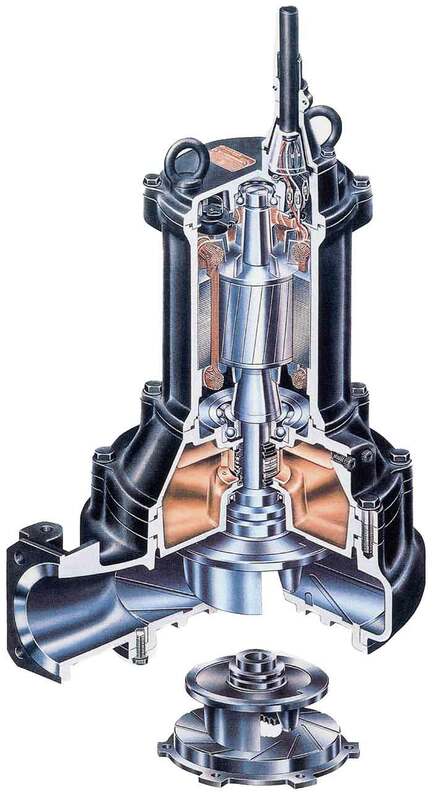 These pumps use a serrated suction cover in combination with a tungsten carbide tip impeller to cut up fibrous and stringy matter allowing sewage to be conveyed without clogging. The cutting edge of the pump cuts up inorganic waste into a slurry so it is able to pass through the pump without any clogging issues. Since the cutter pumps have been installed, there has been a reduction in nuisance clogs and, therefore, a reduction in service calls out to the pumping station. Matt Dobroskey is a sales representative with Mid Atlantic Pump & Equipment Company in Berlin, New Jersey. He may be reached at 856-768-3880. Mike Klimes is the applications engineer at Tsurumi (America), Inc. in Glendale Heights, Illinois. He may be reached at 630-793-0127. For more information, visit www.tsurumipump.com.